In 1916, BMW started in Munich as a producer of aero engines during WWI. The company logo today still reflects these beginnings, showing a spinning propeller in blue and white. During the war, many aircraft were equipped with these engines, among them the famous Fokker fighter planes. In 1919, the world altitude record was broken by an aeroplane powered by BMW. Because of the Versailles Treaty restrictions, motorcycle construction was taken up in 1923. In 1928 BMW further diversified by acquiring a small car company in Eisenach, thereby purchasing the rights to produce the famous Austin 7 in licence under the name „DIXI“. Car construction and improvement took place in Munich, whereas production was still concentrated in Eisenach. In 1930 another triumph for the aeroengine construction department: the flying boat „Dornier Wal“, flown by Wolfgang von Gronau, crossed the North Atlantic from East to West in 44 hours, powered by BMW. Under the names „Hornet“ and „Xa“ BMW now produced its first radial engines, a line which will come to fame during WWII. 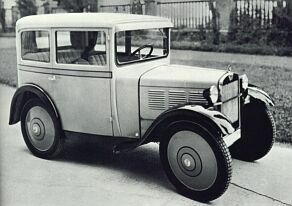 In 1932, BMW presented ist first self-developed vehicle, the 3/20, and a year later the first six-cylinder engine in a 303 model. 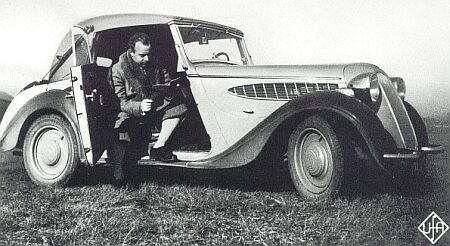 Perhaps the most famous light sports car, model 328, was being sold from 1936 on. In 1938, they won the „Mille Miglia“ race in the sub-2litre class. With the outbreak of WWII the company concentrated on aeroengines once more, although a BMW won the 1940 Mille Miglia competition in a streamlined body. The highest development of BMW radial engines, the 801, was used to power the famous Focke-Wulf Fw190 fighter, which, as flown by the „Abbeville Boys“ from 1941 onwards, was giving the allied airforces a hard time on the western front. From 1943 on, BMW designed jet engines and produced the power plant in series since 1944 until the end of WWII. After VE-Day, the factories had been either destroyed or are being dissembled. BMW was banned from constructing engines for three years. In the 1950ies, the company rose again with the design of luxurious sports cars or tiny bubble cars. 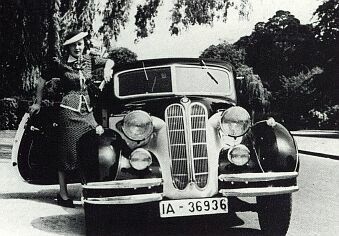 1938 BMW 326, owned by czech actress Lida Baarova, who was reputed to have had a stormy affair with Joseph Goebbels, causing her husband, actor Gustav Fröhlich, to slap the minister’s face.